Advances in technology have created savings in both time and money for Electric Time Company and our customers. A classic example of savings through technology is demonstrated by our tower clock hands. 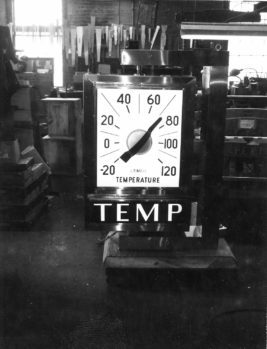 As seen in the rear of a circa 1960’s era photograph of the old Natick factory, our “hand wall” was small and sparse in clock hands. 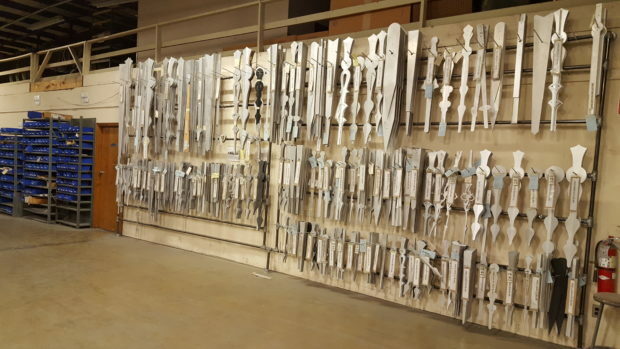 Our current “hand wall” as shown in the recent photograph of our Medfield factory is well stocked. Tower clock hands were once cut by hand – using a band saw or other implements. We now use our waterjet machine which can cut an entire sheet of hands in less time than that single pair would have used! Most of our standard hand styles are stocked and ready for use. 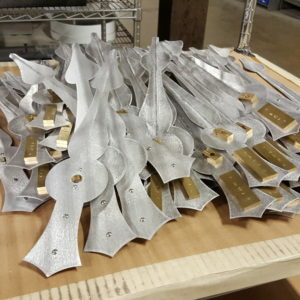 Custom hands can easily be designed by our engineers and cut on the waterjet. New production techniques through technology!